We received eternal life when we first believed. Now we can experience its daily saving us. “Our Savior Christ Jesus, nullified death and brought life and incorruption to light through the gospel” (2 Tim. 1:10). His resurrection nullifies death and His resurrection life changes our corruption into incorruption, thus preparing us for New Jerusalem. Based on this forgiveness, we receive God’s eternal life, an incorruptible life, the life of resurrection. This life matches New Jerusalem, the city of resurrection. 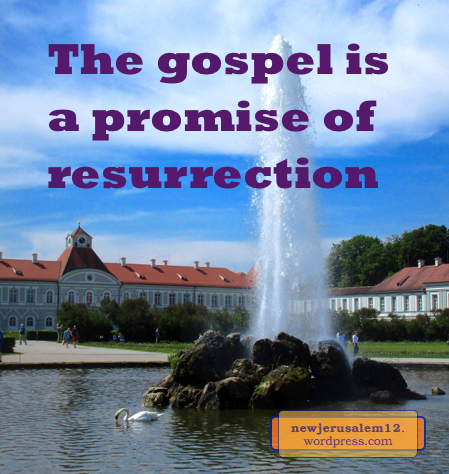 The gospel and New Jerusalem are linked. 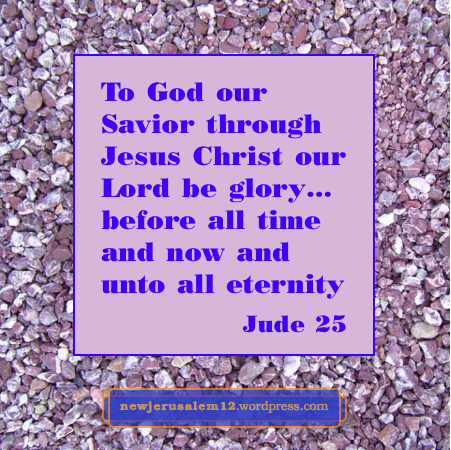 The consummation of “the gospel of the glory of Christ” is New Jerusalem. God chose us “unto salvation” (2 Thes. 2:13) and He also called us through the gospel “unto the obtaining of the glory of our Lord Jesus Christ” (v. 14). Our salvation includes forgiveness of sins, justification, and reconciliation to God, but it also includes much more. It includes all that Jesus Christ is and everything that is in New Jerusalem. God called us through the gospel to receive Jesus Christ as our life and to have Him as our life develop His glory within us (2 Thes. 1:10). When the Lord returns, He will come in glory. At the same time, the development of glory within us will be completed. He “will transfigure the body of our humiliation to be conformed to the body of His glory” (Phil 3:21). Thus, we will all be glorious to match New Jerusalem, the city of glory. The gospel is also “the gospel of the glory of the blessed God” (1 Tim. 1:11). New Jerusalem will shine with the glory of God to bless God and to manifest God as the blessing to the entire new creation. * Part of footnote 1 on 1 Tim. 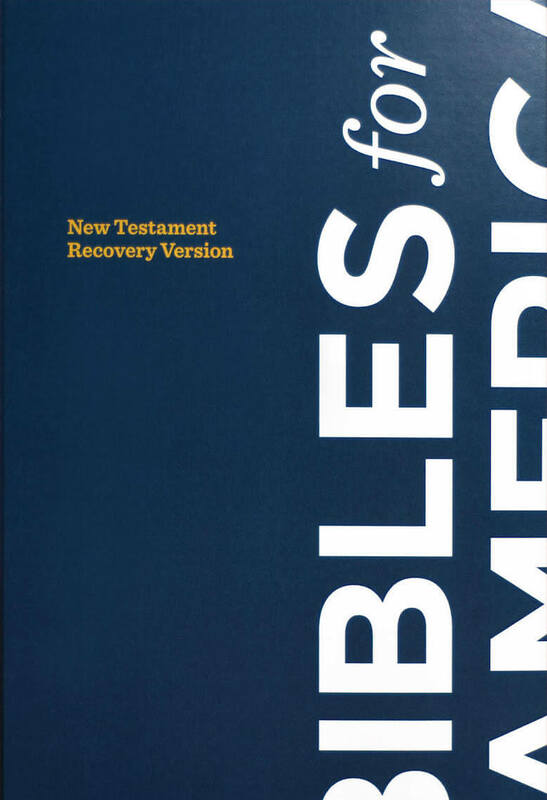 1:11 in the Recovery Version NT, footnotes written by Witness Lee. 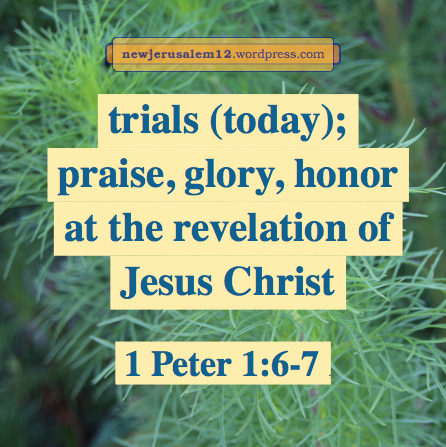 This series of posts presents verses showing that suffering in our Christian life is normal but temporary. This suffering brings forth glory in stages from now to New Jerusalem. This post begins our look at Peter’s view of this process. In 1 Peter 1 we who are regenerated (v. 3) “are being guarded by the power of God through faith unto a salvation ready to be revealed at the last time” (v. 5). This salvation will be the transfiguration of our mortal bodies to free the faithful believers from suffering. We exult in this last time, the time of the Lord’s visible return “though for a little while at present, if it must be, you have been made sorrowful by various trials” (v. 6). These trials are “so that the proving of your faith…may be found unto praise and glory and honor at the revelation of Jesus Christ” (v. 7). Rejoice. Similarly, 1 Peter 4:13 encourages us “inasmuch as you share in the sufferings of Christ, rejoice, so that also at the revelation of His glory you may rejoice exultingly.” His glory is revealed in a limited way through us now, much more at His coming back, and completely in New Jerusalem. Then verse 19 reminds us”let those also who suffer according to the will of God commit their souls in well-doing to a faithful Creator.” Remember that our Creator says we were “created, formed, and even made for My glory” (Isa. 43:7). May we look to His eternal goal, New Jerusalem, remember His faithfulness, and commit ourselves to Him. The testimony of Jesus is the spirit, the central subject, of Revelation. Throughout Revelation Jesus Christ is carrying out God’s economy to eliminate God’s enemies and to develop His corporate testimony, which consummates with New Jerusalem. Now we come to chapters 18-19. Revelation 18:1 says, “I saw another Angel coming down out of heaven, having great authority; and the earth was illumined with His glory.” This Angel is Jesus Christ. He is the One with great authority. He is also the One who fills the earth with glory, by Himself here and later through New Jerusalem. Is Jesus Christ an Angel? Yes! The Greek word means a messenger, someone sent with a message. God sent Jesus Christ to us with the message of His salvation and His purpose. This voice of the multitude marks the start of the next age with the visible kingdom of God on earth, brought in by the prior judgements and by the visible second coming of Jesus Christ. This is the first stage of the visible kingdom; New Jerusalem is the ultimate stage. 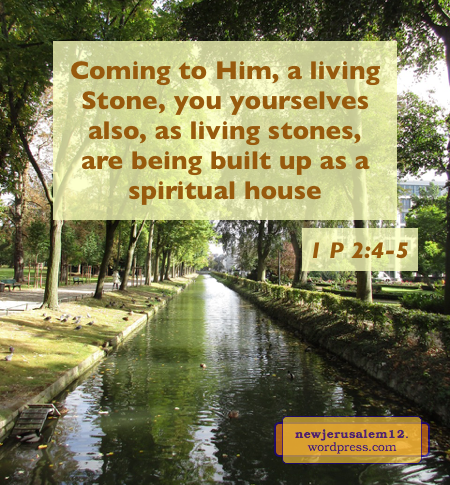 In the New Testament, stones signify living persons. Jesus Christ is a living and precious Stone. God’s New Testament building, including New Jerusalem, is in Him, the Cornerstone in resurrection (Eph. 2:20-21). In the natural realm, human beings are vessels of clay (Rom 9:21), earthen vessels (2 Cor 4:7). In contrast, New Jerusalem has no clay, no dirt, only precious materials. How then can men of clay participate in New Jerusalem? This change of name indicates a change of person, a change of constitution. In God’s salvation, the Lord transforms men of clay into stones for His building. Peter tells us “Coming to Him, a living stone, rejected by men but with God chosen and precious, you yourselves also, as living stones, are being built up as a spiritual house” (1 Peter 2:4-5). This house will be enlarged to become New Jerusalem. We become living stones by coming to Jesus Christ mot only once but by coming to Him continually. As we come to Him, he infuses us with His stone nature, reconstituting us from clay to stone. This builds us together as God’s spiritual house and prepares us for New Jerusalem, God’s eternal dwelling. In the context of Peter’s epistle, our “coming to Him” involves putting away evil things (2:1) and holding to His living and abiding word (1:22-25, 2:2-3). This is our path to New Jerusalem. *The common language in Judea and Galilee in the first century. The phrase “before His glory” reminded me of New Jerusalem, which radiates the glory of God, and the throne in New Jerusalem which is the source of the radiant glory. Of course, “before His glory” is also when the Lord returns visibly (Matt. 25:31) and in His kingdom. God our Savior through Jesus Christ our Lord brings us to the glory “without blemish.” For us to be in the glory and to be glorious, we must be without blemish. Ephesians 1:4 tells us that God chose us “to be holy and without blemish before Him in love.” God is faithful to accomplish what He has said! Ephesians 5:25-27 tell us that Jesus Christ gave Himself for the church (in death), that He is washing the church in the water in His word (now), and that (at His return) He will “present the church to Himself glorious…without blemish.” This is His operating to prepare us for New Jerusalem. We cannot be glorious nor be without blemish by our own effort, but we can cooperate with His operation. Philippians 2:12-15 speak of our “working out our own salvation” by cooperating with “God who operates in us” that we may be “children of God without blemish” shining in the world. The shining is a precursor to the glory of New Jerusalem. Peter also speaks of our cooperation. He says that since we are expecting new heavens and a new earth (2 Peter 3:13), including New Jerusalem, we should “be diligent to be found by Him in peace without spot and without blemish” (3:14). We thank our God and Savior for choosing us, dying for us, washing us, operating in us, and guarding us. May He now keep us cooperating daily. To the only God our Savior through Jesus Christ our Lord be glory! Photo courtesy of Burning Well. Romans 3:23 says, “all have sinned and fall short of the glory of God.” While reading Romans 3 I was touched with the paraphrase in the subject line of this post. New Jerusalem is the ultimate display of God’s glory, so to fall short of the glory is to fall short of New Jerusalem. Sin separated man from God and man was shut out of the garden of Eden (Gen. 3:22-24). Thus man had no access to the tree of life. 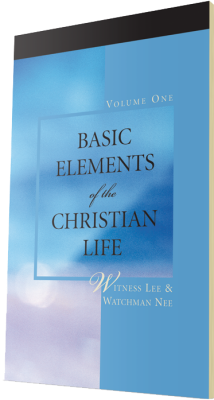 In New Testament terms, man had no access to eternal life, hence no way to express God’s glory. The real expression of every living being is the demonstration of the life within that being. An apple tree bears apple blossoms and fruit because of its life. A dog sniffs and barks because of its life. Unsaved human beings express both good (from created life) and evil (from indwelling sin). Regenerated human beings should exhibit, from eternal life within, the glory of God in a limited way now and in a full way in New Jerusalem. However, regeneration is not sufficient. The life of regeneration must spread and expand in us. This is “much more to be saved in His life” (Rom. 5:10). “Much more those who receive the abundance of grace and of the gift of righteousness will reign in life through the One, Jesus Christ” (Rom. 5:17). May we all long for the much more life and receive the abundance of grace until we are reigning in this life and the glory is brought forth. Lord, cause me to participate in the much more salvation of Your life. Spread life in me so that Your glory can be expressed through me. 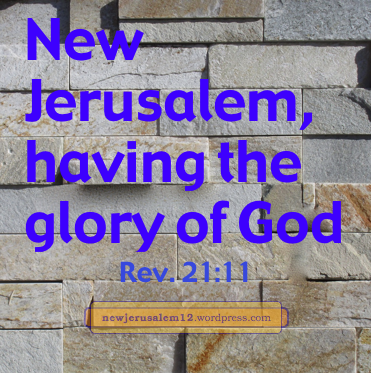 Lord, bring forth the glory of New Jerusalem now! 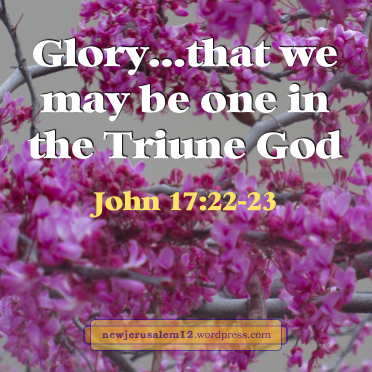 In John 17 the Lord Jesus prayed for our oneness in the Triune God. This prayer includes three stages of oneness—in the Father’s name (one), sanctification in the word of reality (two), and in glory (this post). Three stages in one hymn. In John 17:22-23 the Lord prayed, “The glory which You have given Me I have given to them, that they may be one, even as We are one; I in them, and You in Me, that they may be perfected into one…” The glory is the expression of God. Because we have all received the divine life and divine nature (2 Peter 1:4), we have this glory. The extent to which we live by the divine life and divine nature determines the magnitude of glory expressed. New Jerusalem will be the fullest expression. As before, oneness in the divine glory is not outward, not man-made, not by adherence to a creed, not by following a set of rules. The real oneness, now and unto New Jerusalem, is as “We [the Triune God] are one.” Nothing less, nothing lower. Our oneness is God in Christ in us and we in Him. This matches what the Lord told the disciples, “you will know that I am in My Father, and you in Me, and I in you” (John 14:20). In the Triune God, with the Triune God in us, we “may be perfected into one.” Perfection is a quality of God, not of men. For us to be perfected into one is to be perfected in our living in and because of the Triune God. At times we fail, but we confess our sins and receive His forgiveness. Eventually we will mature in the divine life and come to the reality, the perfection, of New Jerusalem. As in verse 17:21, so in verse 23 the result of the oneness today is “that the world may know.” The perfection in glory is not only for New Jerusalem but even for today. See also Glorification and Oneness in the Triune God. As human beings, we might be very happy and satisfied with these conditions. However, God is not satisfied. Why? Because these remove what is contrary to God’s purpose but these actions do not fulfill God’s purpose nor reach His goal. God’s goal is to bring forth, by His life in human beings, a corporate expression of Himself. 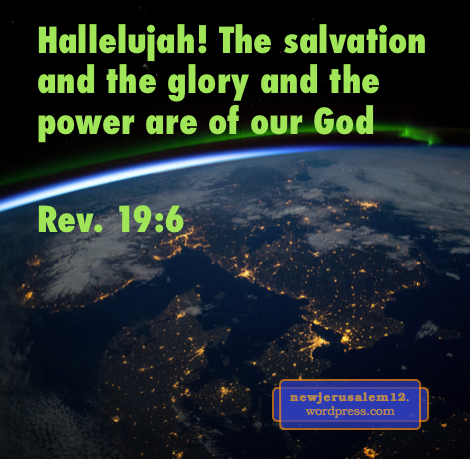 God’s goal is achieved with New Jerusalem “having the glory of God” (Rev. 21:11). The glory of God is the expression of God; this is the primary characteristic of New Jerusalem. The expression of God is accomplished by God’s life maturing in us. 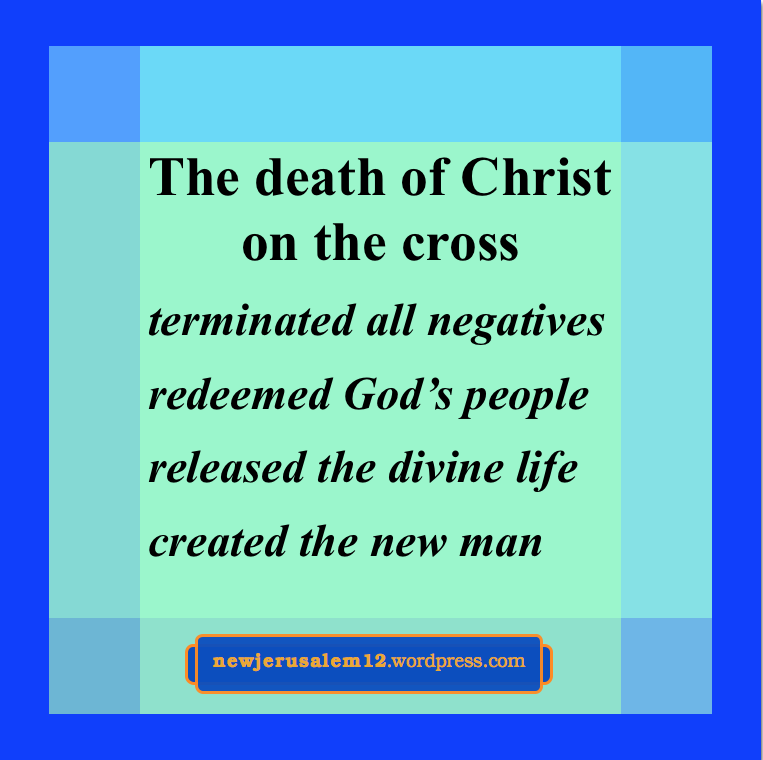 The death of Jesus Christ on the cross removed all the barriers between us and God. The resurrection of Jesus Christ imparted Him as life into us (1 Peter 1:3). The effects of the death and resurrection of Christ are seen in Romans 5:10, “if we, being enemies, were reconciled to God through the death of His Son, much more we will be saved in His life.” Reconciliation with God is a result of the death of Christ, and salvation in life is a result of the resurrection of Christ. The “much more” salvation is the spreading, the increase, of Christ as life in us. The increase of life generates the increase of expression. A small green plant might be unidentifiable, but when the plant grows to full size and brings forth blossoms or fruit, then this expression surely will identify the plant. Likewise, when Christ grows in us to maturity, God will be expressed in full by all of us built together to be New Jerusalem. We were sinners but through God’s mercy His salvation came to us. Now we are His people to display and to tell forth His excellencies (1 Peter 2:9-10), both now and in New Jerusalem. The epistles of Timothy and 2 John were written to respected Christians known to the apostles. Yet they wished mercy even to these advanced believers. Certainly we too still need mercy. Jude was written to believers in general, those who are “beloved in God the Father, and kept by Jesus Christ” (v. 1) and also wishes mercy to them. This too includes us. This mercy is not only related to our being saved from sin, condemnation, and other negative matters. Jude 21 encourages us to “keep yourselves in the love of God, awaiting the mercy of our Lord Jesus Christ unto eternal life.” We have eternal life already; here “unto eternal life” indicates we still need mercy to be brought into the fuller enjoyment of this life in the coming age and the fullest enjoyment of it in New Jerusalem. 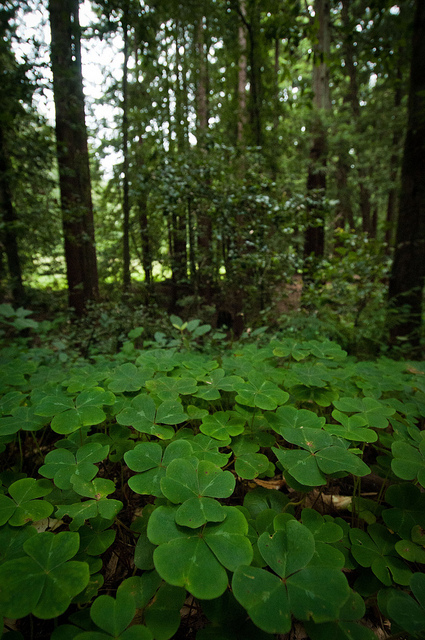 Photo by Lance Cheung, courtesy of U.S. Department of Agriculture.